There are two Baby and Toddler Groups in the Benefice; one is run at St George's, Broad Oak and the other at St Richard's, Heathfield. Both groups are open for anyone to come along, so if you are caring for young children during the day and need an afternoon out of the house with some adult company to share a cup of tea or coffee these groups could be for you, and they both just ask for a contribution of £1 per family. 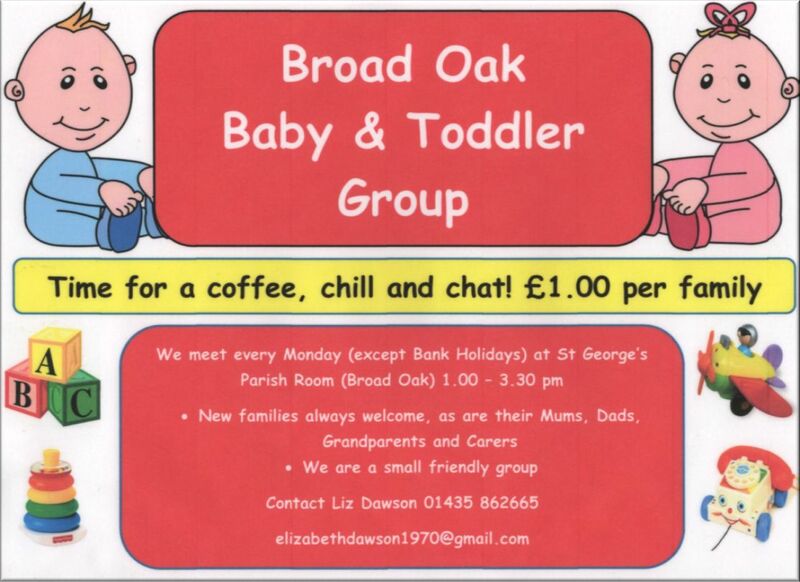 Meet Monday (except Bank Holidays) at St. George’s Parish Room 1:00-3:30pm; the cost is £1 per family. They are a small friendly group and have a good selection of toys, for use both outside and indoors. Use is made of the garden area as much as possible, which has removable fencing. New families are always welcome, as are their mums, dads, grandparents or carers. One of the main features of this group is to give the parents/carers a chance to have a cup of tea and time to relax in the company of others with children of similar age. So if you think that is you or someone you know why not come and along and give it a try. Meets from 2:00-3.30pm on alternate Tuesdays in the Church Hall. It is a small friendly group where accompanied children are able to play with a range of equipment in a safe environment. An age related craft activity is offered at most sessions. Refreshments are available for all ages giving parents, grandparents and carers the opportunity to relax over a cup of tea or coffee. There is a nominal charge of £1 per family to help cover costs.